There’s a scene in Fight Club (Yes, I’m starting off with an “edgy” Fincher reference) in which Tyler Durden directly address the camera, spouting off the anti-consumerist ramblings of an anarchist with Marxist values at heart. The frame warbles in and out of motion, emulating the sputter of 35mm film that has come loose from its sprockets. And at that moment, the watcher becomes all too aware of the analog medium and its exploiter; its prowess may lie in the artistic communication of the implicit, but the medium itself can be mutilated, toyed with, or distorted to provide a more direct means of disclosure. In many ways, Mutant is wholly similar to that fleeting moment. The nightmarish onslaught of twisted samples and DAW manipulation almost seems to run against the notion of music itself, threatening to tumble out of a digital underworld and materialize into one of Jesse Kanda’s fear-inducing deformities. This cold, nebulous amalgamation of pathos and unabashed nastiness has been part of Alejandro Ghersi’s repertoire for some time now. Those who listened to 2014’s Xen will be in a familiar tundra of hollow shrieks and cavernous glitches, but the mournful scenery is comparatively tranquil when juxtaposed behind Mutant’s brutal foreground. Metallic beats are time-warped, chopped and screwed to an unrecognizable point until they become serrated weapons Ghersi hurls at the listener, while the only remotely cathartic sounds waver and tremble in pitch like a carousel ride struggling to come to life. Such is the inner world of a musician who is willing to transcend the boundaries of genre, form, and meter — even artistic projects and mediums themselves. The Venezuelan experimentalist earned his reputation as a producer first and foremost, collaborating with artists such as FKA Twigs, Kanye West, and Bjork over the course of a few years. But neither his collaborative work, nor his previous efforts, aesthetically resemble the unfiltered assault of Mutant. The record’s incorporeality opaquely reflects any sort of meaningful interpretation that the listener doesn’t assign to it with preconceived notions; in other words, it is both uninterpretable, yet personally significant if one wants it to be. 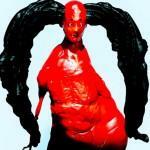 Arca’s ambitions are only suggested at by the fluidity of his music, accompanying music videos, and Kanda’s artwork. The haunting evocations of each imply that the very shapelessness of Mutant relates to the constantly shifting self-perception of the body. Tracks take on a linear, meandering direction; abandoning structure at will, disassembling themselves, and re-coagulating into a shapeless gelatin of indescribable, electronic decadence. This formlessness largely works to Ghersi’s advantage. In compelling the listener to approach his music experientially, Ghersi is able to successfully create an almost fantastical sub-reality that can only be occupied through this record. Songs like Vanity and Snakes are anchored by a flanged synth melody, allowing the chaotic bubbling of sirens, chants, and breaths to establish an atmosphere of frost-bitten loneliness. In the album’s title track, the inclination towards time signature is fragmented by claustrophobic rumble, until a two-note rush of synth strikes gives form to the bloodbath of sequenced bass. At other points, Ghersi subverts traditional instrumentation instead of eschewing it all together; the polyphonic plucks and strums of songs like Sever and Gratitud seem to have originated from an acoustic guitar or a harp. This transfiguration, along with others, relates back to the “mutant” nature of an amorphous, ever-changing, bodiless mass. Arca’s latest record is obscurantist to a certain extent, even if it does attempt to transcend the medium through which it is played. The record’s lack of organization and resistance to stasis work against its accessibility. Those willing to mine such a dense work will be rewarded in a visceral sense, but may be left groping in the darkness for a specific, externally-fabricated meaning. Either way, the abstractness and wandering abandon of Mutant define not only the album, but Alejandro Ghersi’s approach to music.